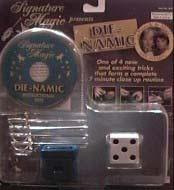 A large die is placed in the Die-Namic sword box. Four swords then are run through the box and penetrate the die. The swords are removed, the box opened and the die dropped into the spectator's hand. This is the closing effect in the fabulous close up act designed and routined by Petrick and Mia.